Tickets are not available as this courses has passed. Learn the functionality and commands necessary for 2D drawing and design using the latest version of AutoCAD LT on this hands-on, two-day course. This AutoCAD course has been specifically designed for beginners and those who want to brush up on their skills in AutoCAD. AutoCAD is the most widely used drafting and computer-aided design (CAD) software in the architecture, engineering, construction and manufacturing industries. Therefore, if you’re looking to learn CAD and securing a new job, AutoCAD is the best place to start! During this two-day course, our AutoCAD instructor will teach you the fundamentals of AutoCAD 2018 including how to confidently navigate the user interface, as well as how to modify, edit and plot drawings. Why should you choose Benchmarq Training? 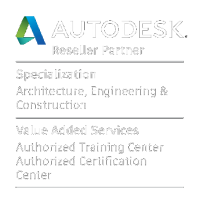 We are an Autodesk Authorised Training and Certification Centre, as well as Autodesk Partner. Our trainers are AutoCAD Certified Professionals and Autodesk Certified Instructors. This means you will get the best possible training and technical support. In addition, once finishing the course you will receive an official Autodesk certificate of completion. At Benchmarq Training we truly care about our customers – even after you’ve left the course! Therefore, all of our students will receive a complimentary AutoCAD beginner’s textbook, AutoCAD shortcuts guide and access to three months’ telephone support after the course. Our AutoCAD training courses are booking up quickly. Book today using our online booking system or call us on 01403 784139 if you would like more information about this AutoCAD Essentials Course. During this two-day course you will learn about the functionality and commands necessary for 2D drawing and design using AutoCAD LT 2018. Benchmarq is a fully Authorised Autodesk Training Centre and you will be awarded an official Autodesk Certificate on completion of the course. This course will start at 10am and run until 4:30pm each day. Drawing lines, polylines, polygons, rectangles, circles, ellipses etc. The course will run with a maximum of 6 attendees, no previous AutoCAD experience is necessary but a basic knowledge of using Microsoft Windows computers or Mac will be required. All training equipment will be provided on the day including computers and software.